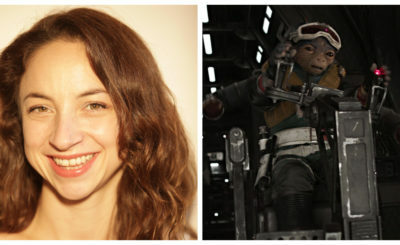 Annie Stoll is one of the artists from Star Wars: Women of the Galaxy. 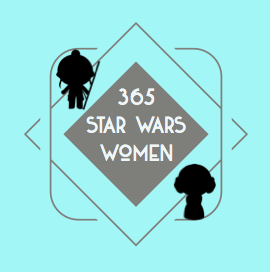 She was kind enough to answer a few questions via email for 365 Days of Star Wars Women. My siblings and I have really loved Star Wars from a very young age. My dad used to tell me Star Wars like a bedtime story when I was little and when my Grandpa came to live with us, he bought us a VHS player and the original Star Wars Trilogy were the first VHS we had! It was so cool and I’ve been a huge fan ever since. 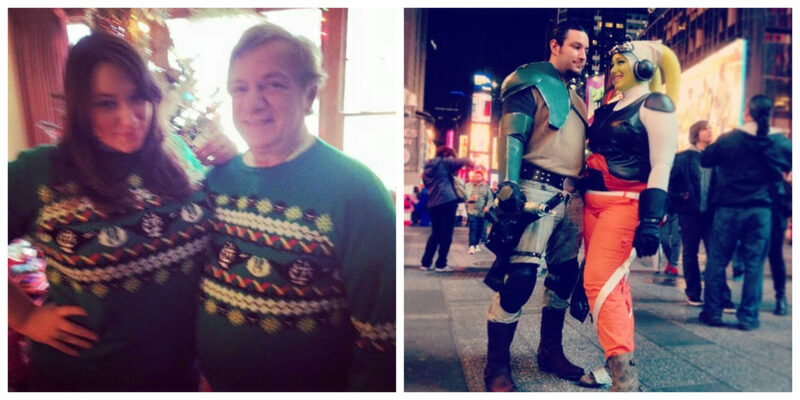 Annie Stoll with her dad wearing Star Wars sweaters she designed and with her husband cosplaying. I don’t always want to answer SABINE! For every question, but for real I’d love to hang out with Sabine! I feel a real connection to her because she is a fellow artist. And it looked like so much fun to paint that TIE fighter!! Beyond that I’m really fascinated with the art history of Mandalore– there is a lot of rich lore there that I’d love to pick her brain about. I think we could get into a lot of trouble in the best possible way. Rey fanart by Annie Stoll. I’ve been drawing as long as I can remember. My mom told me that when I was four someone asked me what I wanted to be when I grew up and I said “a poet” and no one had any idea where I got that from! So I guess age 4! But as far as taking art seriously as a career, by the time I was in high school I was drawing all the time and loved my art classes so much. My family and those in school encouraged me to learn more about design and go to college for it which was perfect for me since design really allowed me to do a little bit of everything I love and have a career that I can grow in! Do you prefer drawing digitally or drawing with pen and paper? I love both for different reasons! I don’t think one is better than the other it really just depends on what I’m feeling or what vibe is right for the art I’m working on. Is there a piece of your work that you think would best show people unfamiliar with your work what your style is and what kinds of subjects interest you? That’s a hard question since I feel like I have a lot of different modes to my art from design to illustration. 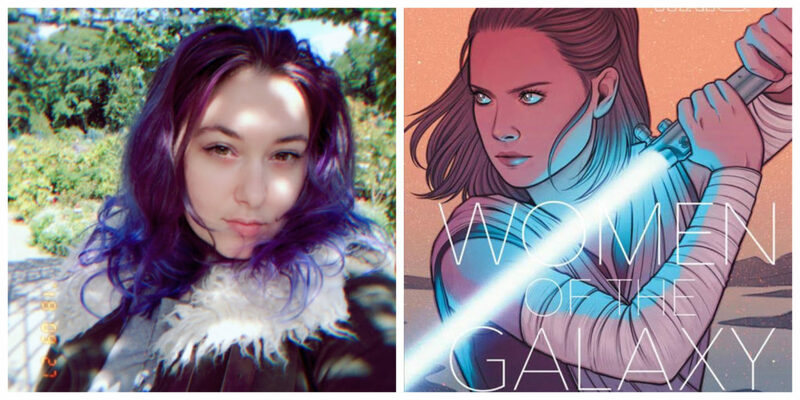 If you’re a Star Wars fan and interested in my jam, I think that Star Wars: Women of the Galaxy is a great book to see how my illustration style has evolved for sure. Your day job is art director for Sony Music. Can you give me an idea of what a typical day for you might look like? Is there a project you are the proudest of from your time at Sony Music? Every day is different and a crazy wild ride but I wouldn’t have it any other way. Sometimes I’m in the office designing and other times I’m traveling to locations to work with clients and direct photo shoots. It’s super challenging but also very rewarding. 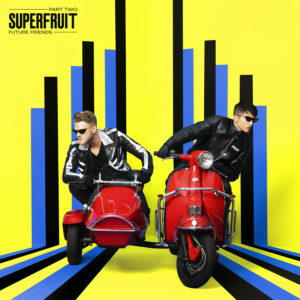 I’m most proud of my work with Superfruit, an amazing queer pop duo- it was a great collaboration and I got to be super creative. Recently, I got to work with Weird Al Yankovic on his retrospective vinyl Squeezebox collection and that was a total dream project that I’m super proud of. The work you did on Star Wars: Women of the Galaxy wasn’t your first experience working with Lucasfilm. 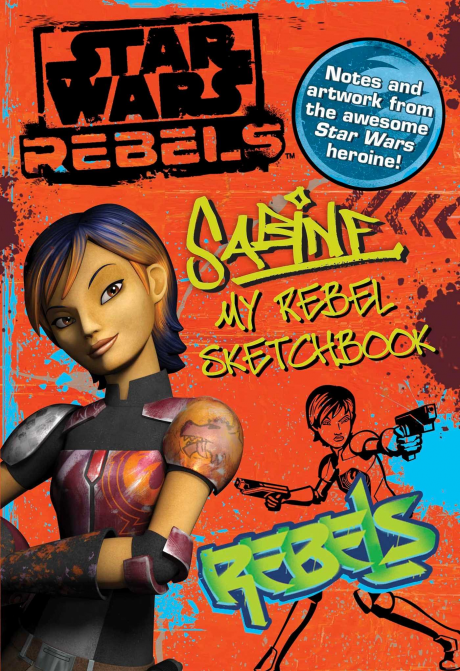 You’ve created designs for Lucasfilm merchandise and did the illustrations for the book Sabine: My Rebel Sketchbook. Which of those jobs came your way first? 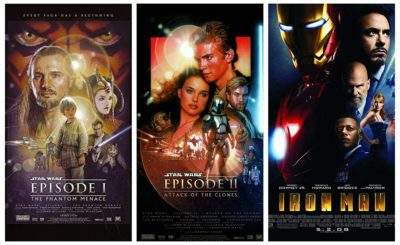 I’m so very grateful and honored to have worked with Lucasfilm before! Talk about a dream gig!! I worked with Troy Alders on merch designs first. 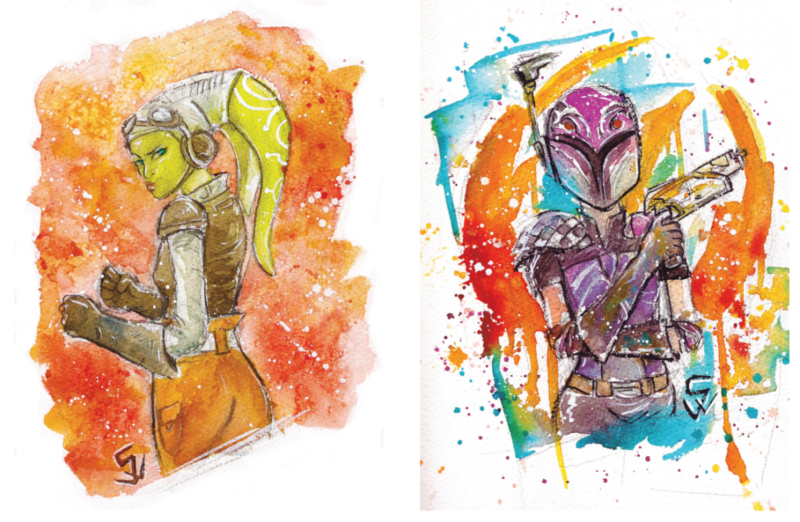 Lucasfilm was familiar with my work from that and when the Sabine sketchbook opportunity happened, they thought of me. I’m still pinching myself over it because was such a fun gig! For the Sabine book (which came out in early 2015) I’m curious if your work happened before the show premiered in the fall of 2014. Basically, if you were able to see Sabine in action much in the show before you did those illustrations or if you were working off concept art from other artists. While I hadn’t seen the show yet, I had seen the trailers that were out and I was given very comprehensive references and resources about Sabine, so I had a really excellent sense of who she was and where she wanted to go. There were some scenes such as when Sabine draws Ezra and Zeb on the bunk bed that were described to me to draw that when I saw the show later, I wasn’t 100% accurate on. However, since I was drawing her sketches, I think it gave me a bit of leeway– all artists do many sketches which evolve before a final piece happens. One of the coolest things about working on this project were things that were insights into Sabine and her process as a character such as doing the preliminary sketches of what a Starbird is and how that logo evolved. It was a really amazing experience that I’m still so grateful for. Illustrations Annie Stoll created to promote the book Sabine: My Rebel Sketchbook. 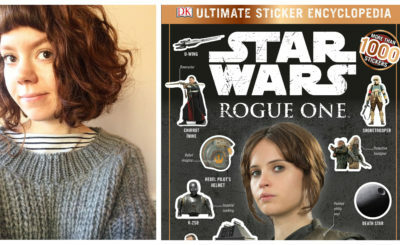 I’d love to hear about the design work you did for Lucasfilm merchandise and how that process differed from creating illustrations for a book. 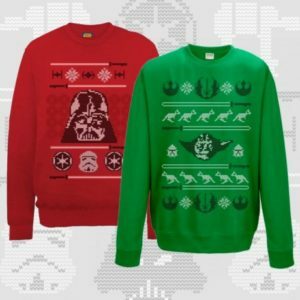 Star Wars sweaters designed by Annie Stoll. Process-wise it wasn’t that different. I was working with an art director both times and submitting sketches and then executing what the directives asked for plus coming up with creative additional ideas. The difference is that for Sabine, it was 100% illustrative whereas working on the design side sometimes I was using established assets and remixing them in addition to illustrative elements. I would say that no matter what in my experience working on any Lucasfilm-involved-project, it is a really wonderful experience full of a team of people who love artists, encourage you to be yourself and are really collaborative and helpful. 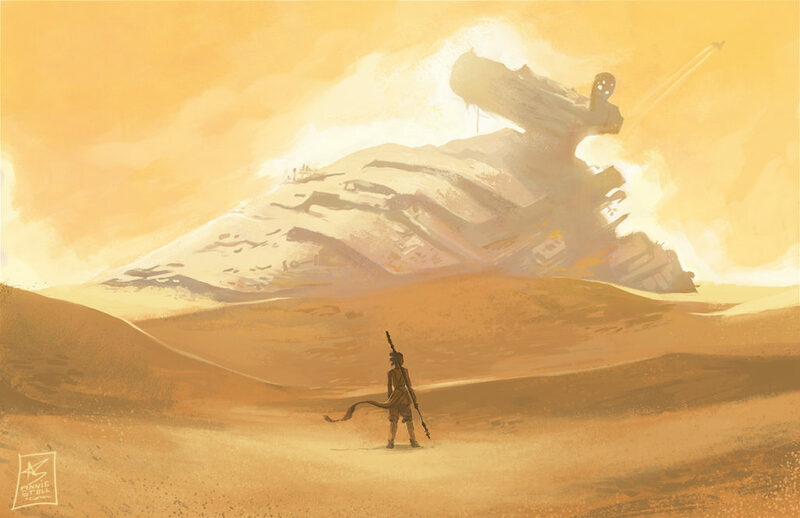 How did you become one of the artists involved with Star Wars: Women of the Galaxy? I got a really amazing email from Chronicle asking if I’d like to be a part of the project and I freaked out and then said yes! Did you have any say on which character you were going to illustrate for this book? Were you very familiar with this character (and particularly images – either officially licensed or fanart of this character) before you started this project? Characters were assigned to us. I’m still super stoked and honored to draw all the characters I was given- they are my favs and were a blast to work on. I was familiar with pretty much all of them, though I got to learn more about each of them. I was so happy to have the privilege to draw Sabine again- that was a really exciting moment. Another example, I had seen Enfys Nest in the Solo trailer, but at the time I was drawing her, it was a spoiler that she was a woman so it was really cool to get to see her references and draw her in a powerful pose. 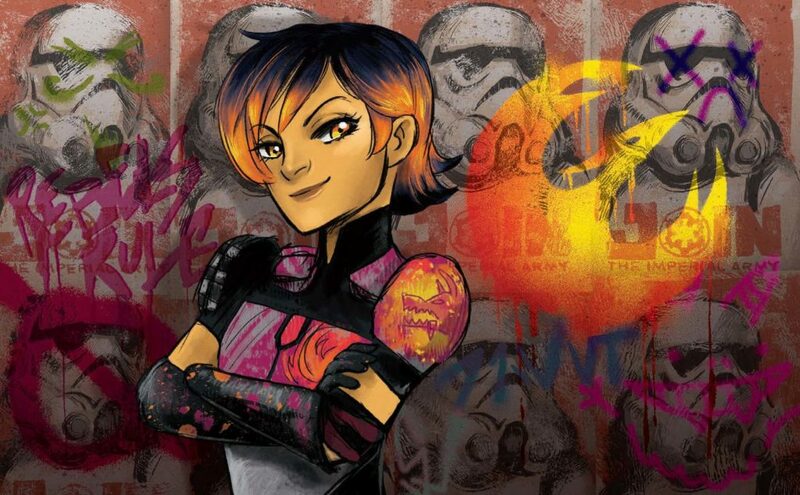 Sabine Wren in Star Wars: Women of the Galaxy by Annie Stoll. Once you knew which characters you were going to draw what was your process? Did you know right away what the images would look like? Did you send in a few different illustrations to the editor or just work on just one? For some characters I was given direction or ideas about what they wanted to see in the illustration. On others, I got to pitch ideas. I was pretty enthusiastic so I would make four to six sketch options along with color or mood boards. Then Chronicle and Lucasfilm would review and get feedback to me, I’d work on the finals- there would be one more round to review and they’d either be approved or if there were any changes, I’d make them. For instance, on my Maz drawing, they asked me to add in two moons into the sky which I was very excited to draw! What projects do you have coming up and where can people find more of your work? Thank you so much for asking questions! I’m so honored and thrilled to be a part of this amazing book alongside such wonderful talented women and non-binary creators and of course the absolutely incredible Amy Ratcliffe!